It’s the last day of the month, so that must mean it’s time for another gluten&dairy-free-pie-of-the-month post! Strawberries (and delicious ones too!) have already made their way to my farmers’ market, and so I seriously thought about a strawberry pie this month, followed by two more strawberry variations for April and May, but opted instead for a savory one. I saw a Martha Stewart recipe for a quiche with a hash brown crust and was immediately smitten with the idea. But the recipe was a bit lacking- you dump a bag of frozen hash browns in a pie pan and bake it for a measly 25 minutes, which didn’t seem like enough time to get the potatoes sufficiently crispy. Then, on instagram a few days ago, mrswheelbarrow posted a pic of a gorgeous potato crust all ready for the oven. She very kindly explained her technique to me (which is listed in the recipe below) and the results were just as I’d hoped for. Like a delicious latke, beautifully seasoned, firm but easy to cut through on the bottom of the quiche and delightfully light and crisp around the edges. The inside of the quiche features local bacon from Flying Pig, spinach from my garden (planted as a lovely surprise by the Kitchen Gardener!) and my favorite easy quiche filling, with the normal heavy cream and milk mixture replaced by a can of full-fat coconut milk. I was very happy with it, and it is one of those blessed results where you miss neither the gluten nor the dairy. For the crust: Preheat the oven to 425 degrees. Peel the potatoes and onion half and grate them, by hand or with the grater attachment of your food processor if you’ve got one. Put the grated potatoes and onion in a colander set in the sink, and let sit for a few minutes. Grab one small handful at a time and squeeze as much water out as possible, until you’ve squeezed it all, then let sit for another 5 minutes or so and squeeze all the water out again. The more water you’re able to squeeze out the better your final product will be- it’s worth being meticulous here! Transfer the squeezed-out vegetables to a medium bowl, and toss with the two beaten eggs and plenty of salt and pepper. Press the potato mixture into a pie pan or a springform pan, pushing the mixture up the sides. Bake the crust for 40 minutes. Then take the crust out of the oven, brush all over with the canola oil, and put back in the oven for an additional 10 minutes. For the filling: Meanwhile, dice the bacon into roughly 1/2 inch pieces and put in a cast iron skillet set over medium heat. Cook, tossing occasionally, until most of the bacon is crisp, 5-7 minutes. Remove the bacon with a slotted spoon and drain on a paper towel. Pour off all but about a tablespoon of the bacon fat into a small bowl for another day and add the washed and chopped spinach to the bacon-greased skillet. Cook until the spinach has wilted and much of the water has evaporated, about 3 minutes, and season with salt and pepper. For the quiche: When the crust is done, lower the oven temperature to 375 degrees. Sprinkle the bacon in the bottom of the crust and distribute the sauteed spinach on top of that, as evenly as possible. Put two whole eggs and two egg yolks in a medium bowl. Whisk gently and then add the can of coconut milk and a good amount of salt and pepper (at least a teaspoon of kosher salt) and whisk again so that the ingredients are well blended. 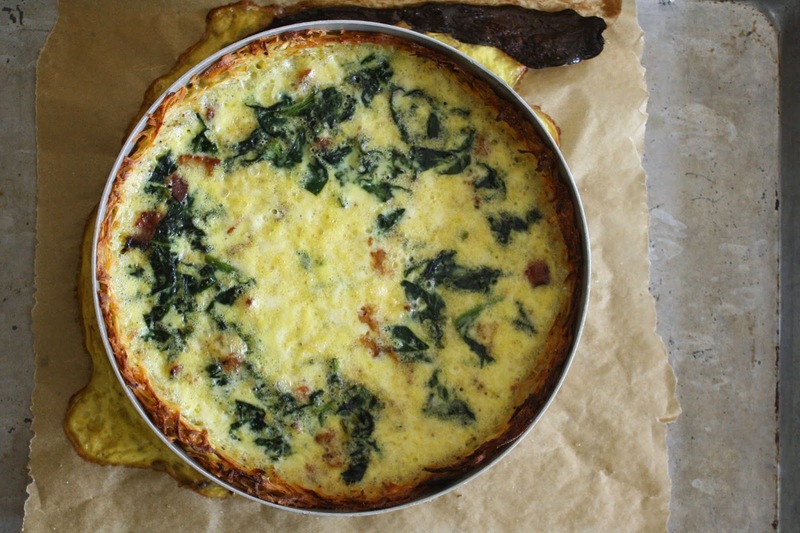 Pour the egg mixture over the bacon and spinach and put the quiche in the oven and bake for 40-45 minutes, or until the center of the quiche is set when you jiggle the pan. Let cool a bit and eat warm or at room temperature. I'm making this today using some of my goose eggs, excited! Thanks for posting the recipe. A little painting based on a photo by @emilyreesnunn that I couldn’t get out of my head. A quick watercolor of the cabin where we stayed during our Arkansas crystal mining trip. Gonna send it to the Airbnb lady who rented it to us, if she’ll take it. We’ve got about two dozen of these big beefy swallowtail caterpillars on our dill and fennel and I love them with all my heart. Can you tell which half of the family would very much prefer not to be in a family photo? A real gem of a peaceful morning with Henry and George and open windows and painting. THE CRYSTALS! Arkansas trip part II- we spent two days digging around in the Tailings at the Wegner Quartz Crystal Mine (also shopping at their brilliant rock shop and using the sluice). The first day I mostly sat in one spot and dug as deep as I could, which it turns out is not a winning crystal-mining strategy. The second day we crawled all over the dirt mounds, mostly poking around the top for crystals, and having much more luck (finding big clear quartz points). We went back to the cabin each day and washed our crystals in the creek. We all loved the experience so much- thank you for making this happen, @foxspritee! It was such a joy to go on this trip with you and your family! The crystals and rocks I brought home will be incorporated into future @persimmonandlake projects- I can’t wait to show you!